Domestic violence is not just a women’s issue. That’s the key message that resonated among more than 850 domestic violence organizations nationwide in Mary Kay’s 2016 Truth About Abuse Survey, which reveals that nine out of 10 participating agencies have made concerted efforts to involve men in domestic violence prevention. 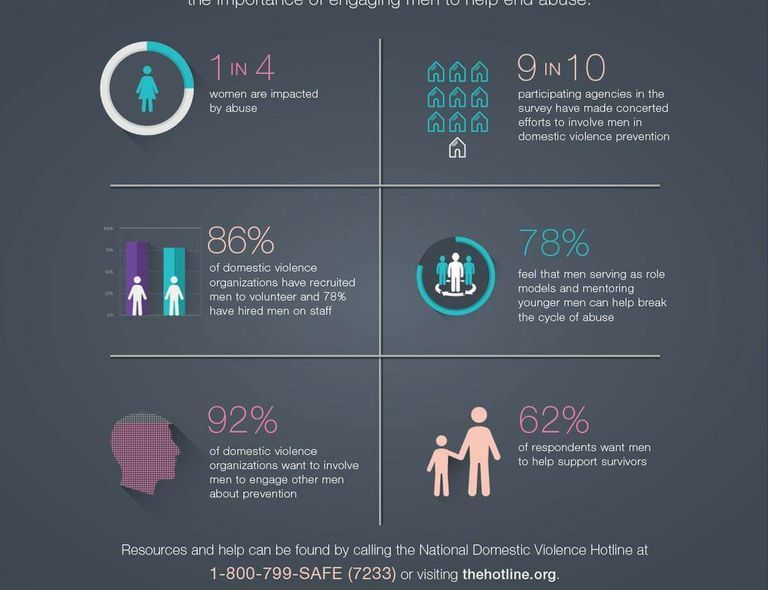 In partnership with Break the Cycle, the Mary Kay seventh annual Truth About Abuse Survey found that an overwhelming 92 percent of domestic violence organizations believe it’s important to engage men in prevention and education efforts. Nearly half cited domestic violence as a community issue that is everyone’s business. DALLAS – Oct. 3, 2016 – Domestic violence is not just a women’s issue. 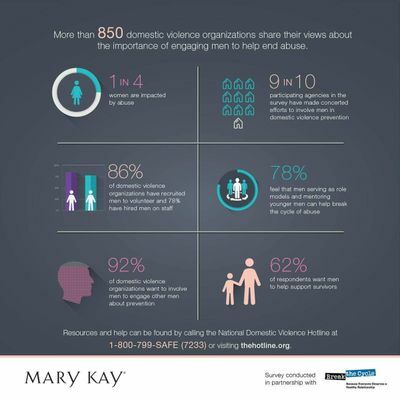 That’s the key message that resonated among more than 850 domestic violence organizations nationwide in Mary Kay’s 2016 Truth About Abuse Survey, which reveals that nine out of 10 participating agencies have made concerted efforts to involve men in domestic violence prevention. In response to the overwhelming data revealed in the survey, Mary Kay Inc. will host an inaugural Men Don’t Look Away Summit on Nov. 2 in Dallas. Attendees, including men and domestic violence advocates from across the country, will receive a framework to engage men as advocates, volunteers and ambassadors on a grassroots level, activating this powerful group of change-makers within their local organizations. The Men Don’t Look Away Summit and Truth About Abuse Survey are part of the Mary Kay Don't Look Away campaign which works to educate the public on recognizing the signs of an abusive relationship, taking action and raising awareness for support services. 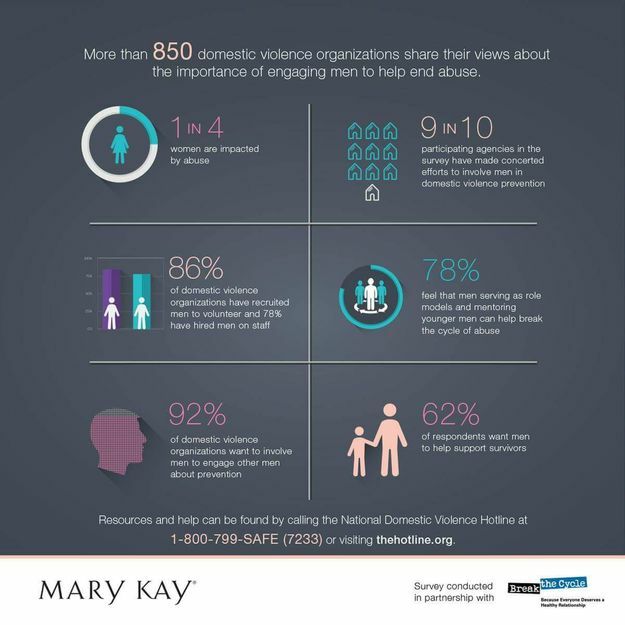 To date, Mary Kay Inc. and The Mary Kay Foundation℠ have given $53 million to domestic violence prevention and awareness programs in an effort to end the cycle of abuse. Irresistible products. Positive community impact. Rewarding opportunity. For 50 years, Mary Kay has offered it all. With 3 million Mary Kay Independent Beauty Consultants and $3.5 billion in global annual wholesale sales, Mary Kay is a top beauty brand and direct seller in more than 35 markets around the world. Discover what you love by connecting with a Mary Kay Independent Beauty Consultant in your area at marykay.com. Break the Cycle believes everyone has the right to safe and healthy relationships. As the leading voice for teens and 20-somethings on the issue of dating violence, Break the Cycle inspires and supports young people to build healthy relationships and create a culture without abuse. We work collaboratively, providing loveisrespect in partnership with the National Domestic Violence Hotline, to support young people through every stage of their dating lives. For more information, please visit breakthecycle.org.